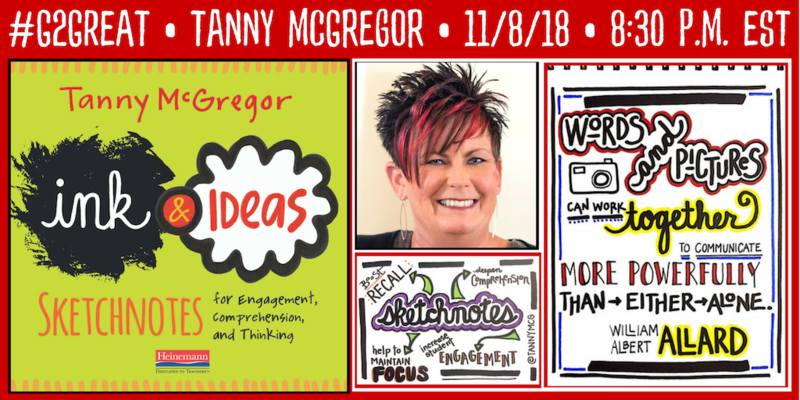 On November 8, 2018, the #G2Great community had a powerful conversation about sketchnoting with Tanny McGregor. 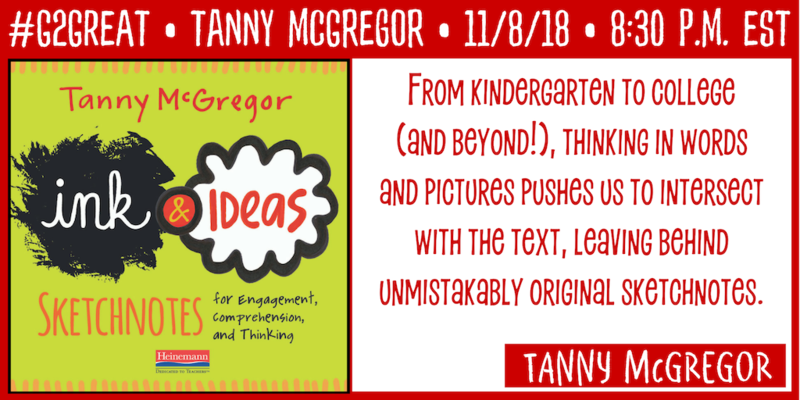 In her latest book, Ink & Ideas Sketchnotes for Engagement, Comprehension, and Thinking she makes a convincing case to add sketchnoting to instructional practice. 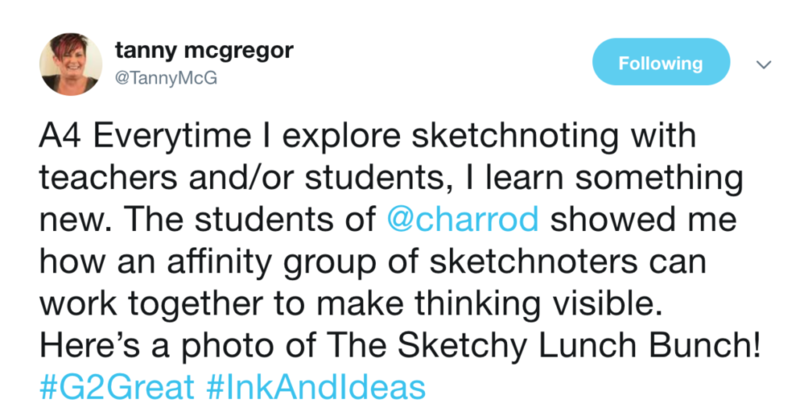 Sketchnotes are a visual form of notetaking, They offer another option for learners to make thinking visible in ways that make sense to them. 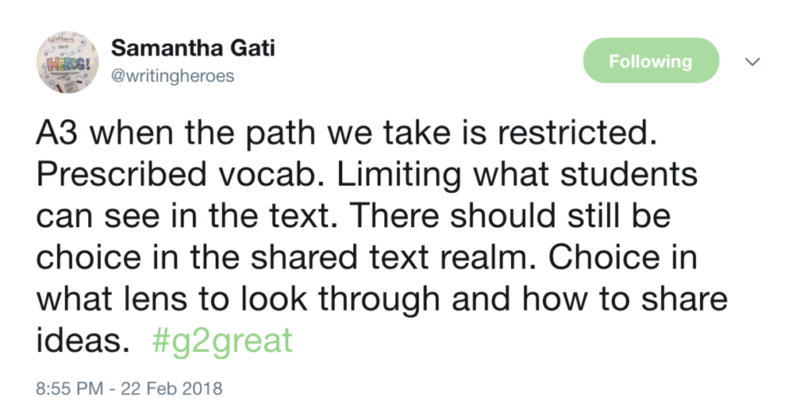 There is so much to love when it comes to the conversations we have on #G2Great, but one aspect of the chat that I love the most is the openness to new ideas. 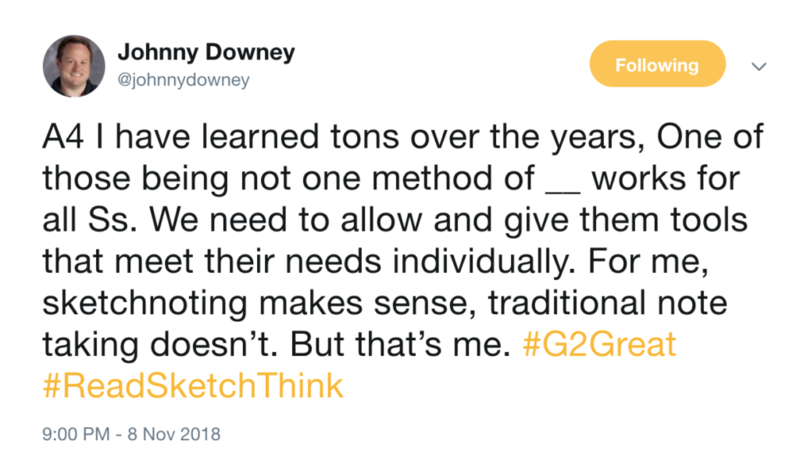 For many of us, sketchnoting is a new idea. 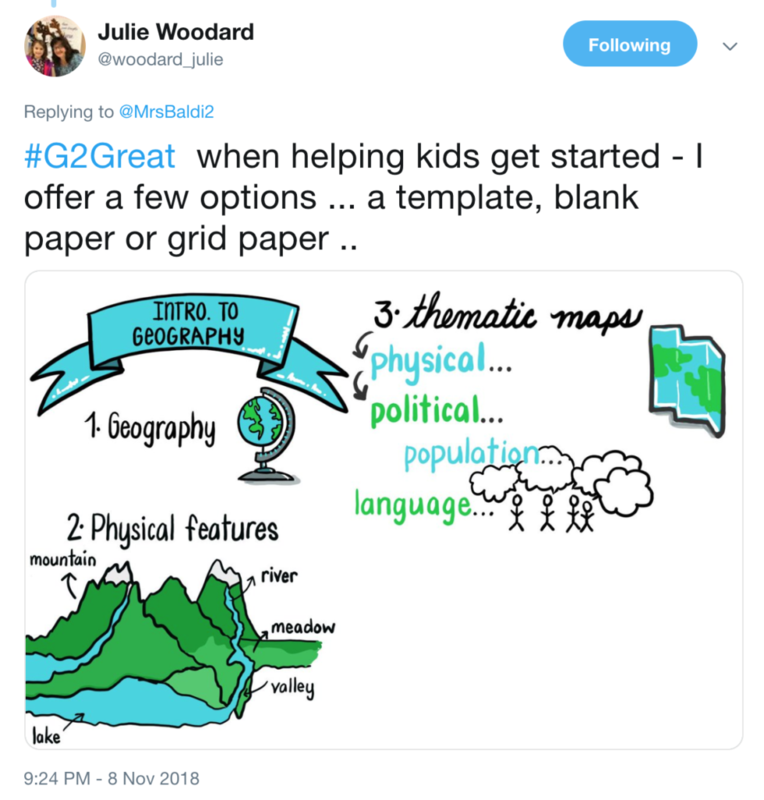 We have been trained to write notes in a specific way or to use predesigned graphic organizers. Why? My theory is that it keeps learning controlled and neat. 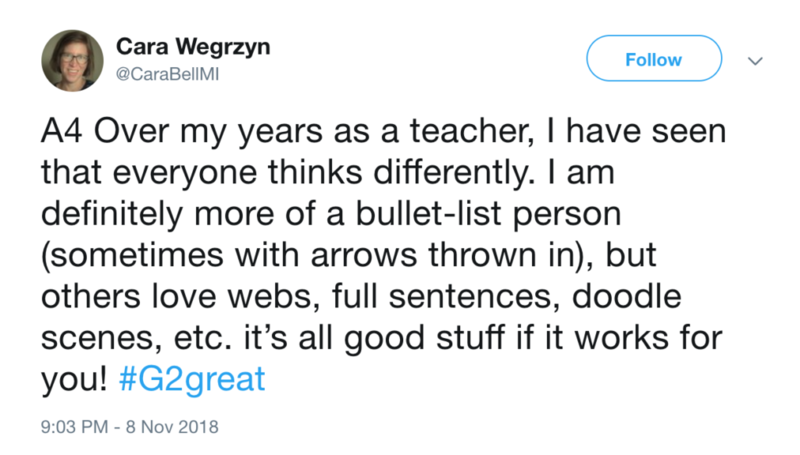 However, is it the best way to learn? Who knows best? The learner does! We can assess their success by students’ ability to comprehend what is being taught not how to record the learning. There are so many ways to learn. 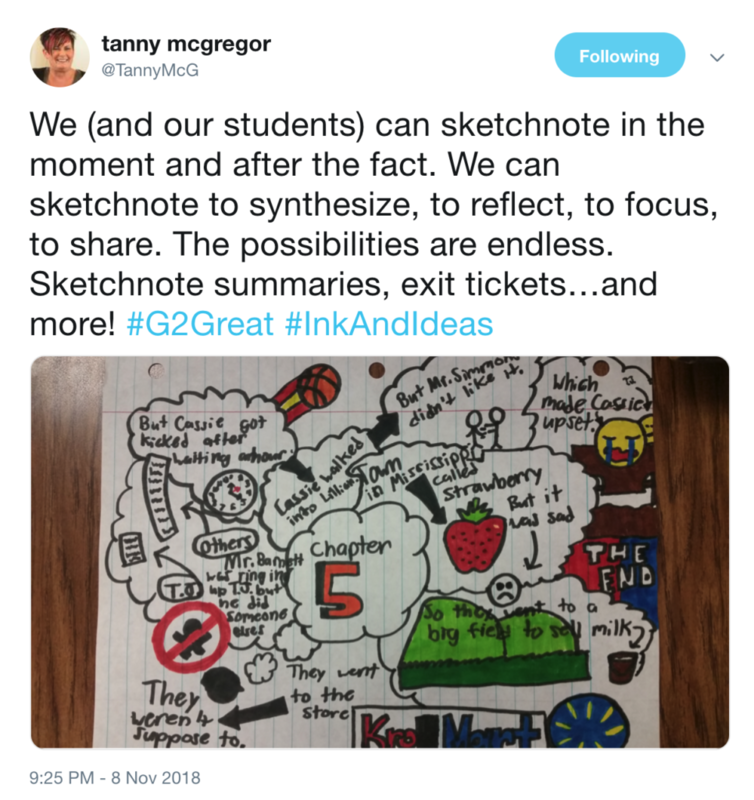 Challenge students to give sketchnoting go! 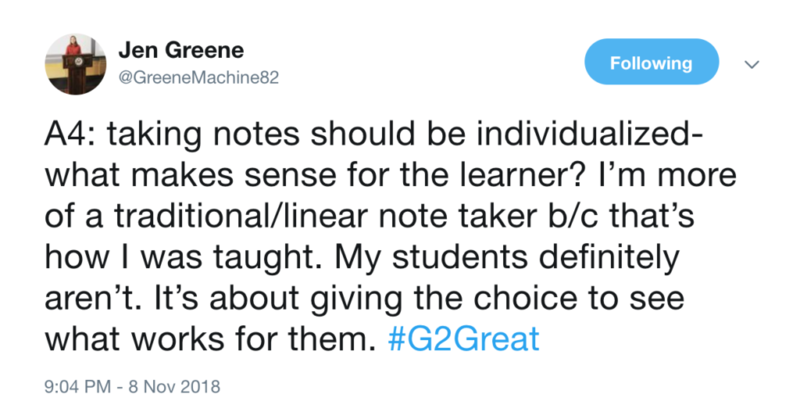 Ask students to experiment with new ways of note taking! 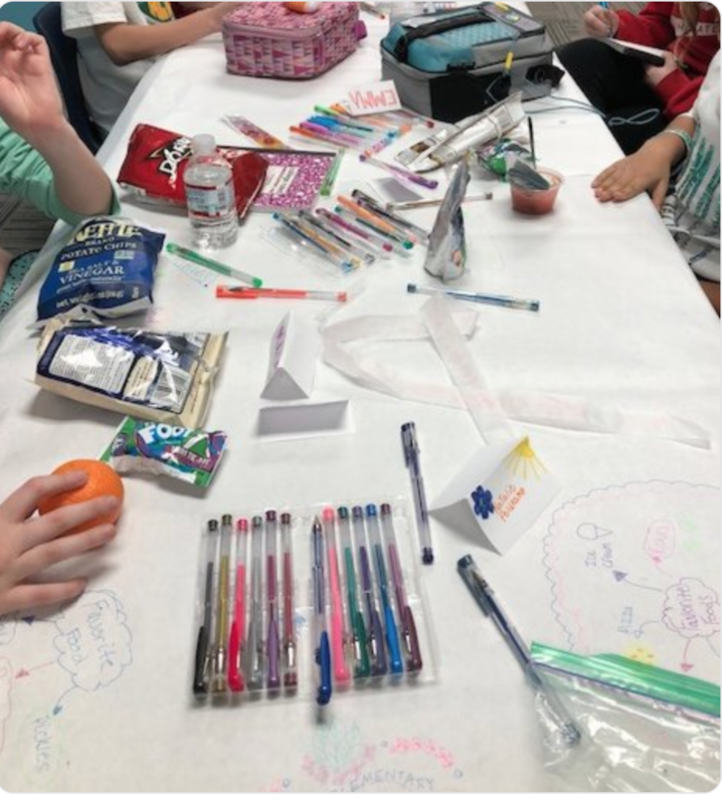 Encourage students to start with a doodle! 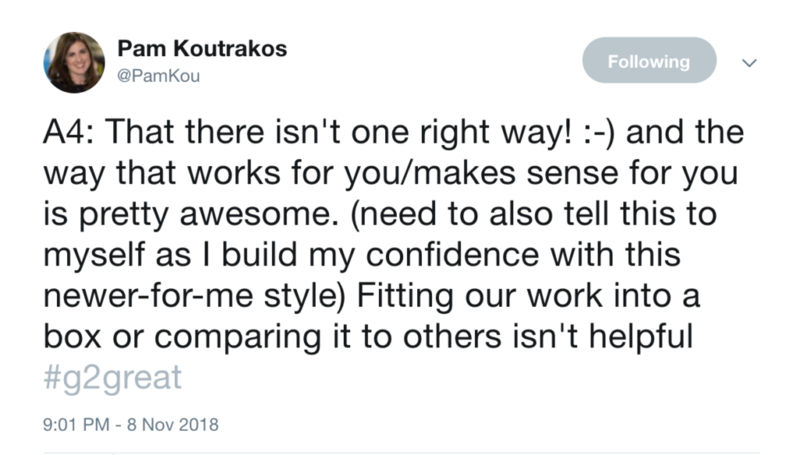 Try out modeling the practice first! 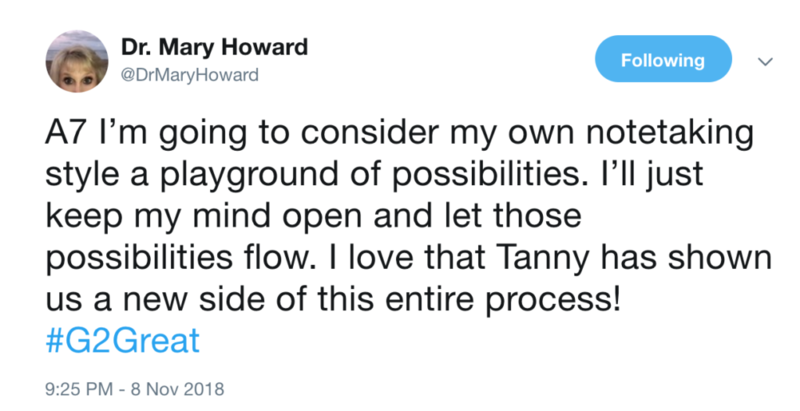 Thank you, Tanny. We appreciate your taking the time to share your wisdom with our community. 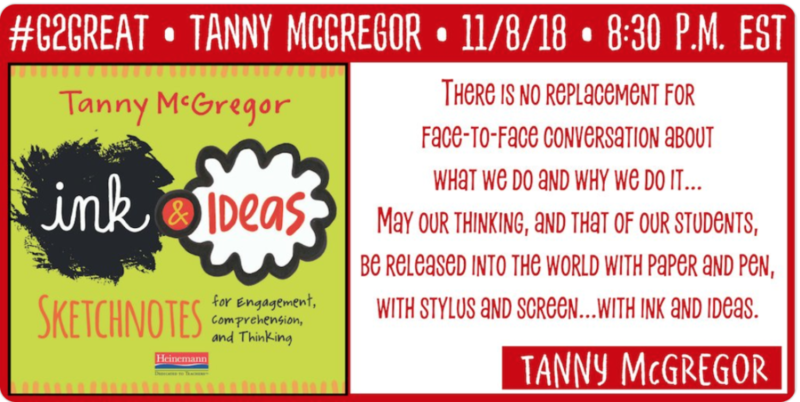 Thank you to Heinemann Publishers for sharing the love with a FREE copy of your fabulous book, Ink & Ideas Sketchnotes for Engagement, Comprehension, and Thinking! 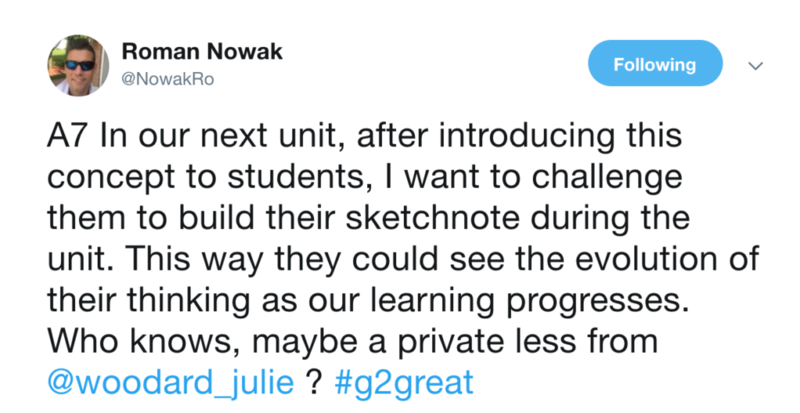 But mostly, thank you, for pushing us to think beyond conventional practices to more student-centered ones like sketchnoting. Not only is your work founded on best practice but it is driven by choice and that can make all the difference. 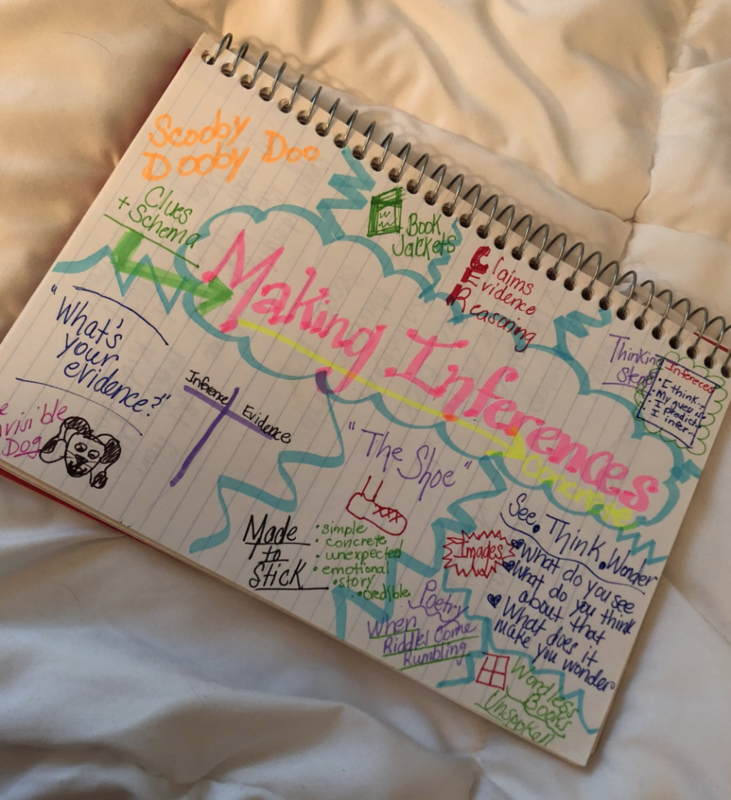 Her session with Smokey/Nancy Steineke: NCTE Houston, TX on November 15. Title: “Looking to Learn”. 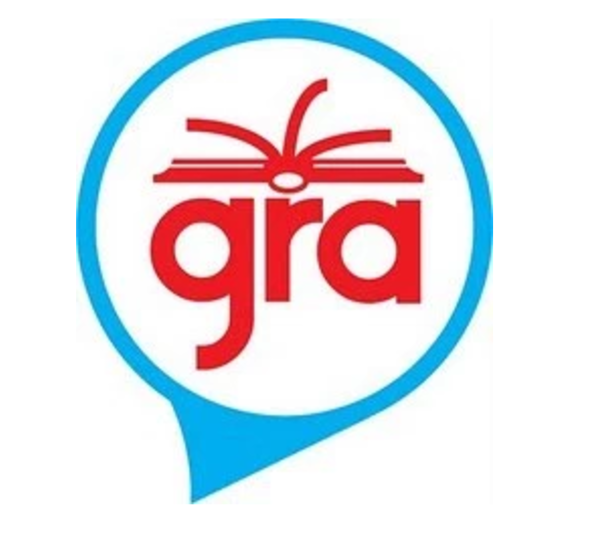 Recent podcast OCTELA/chapter of NCTE. I’m episodes 9 & 10. 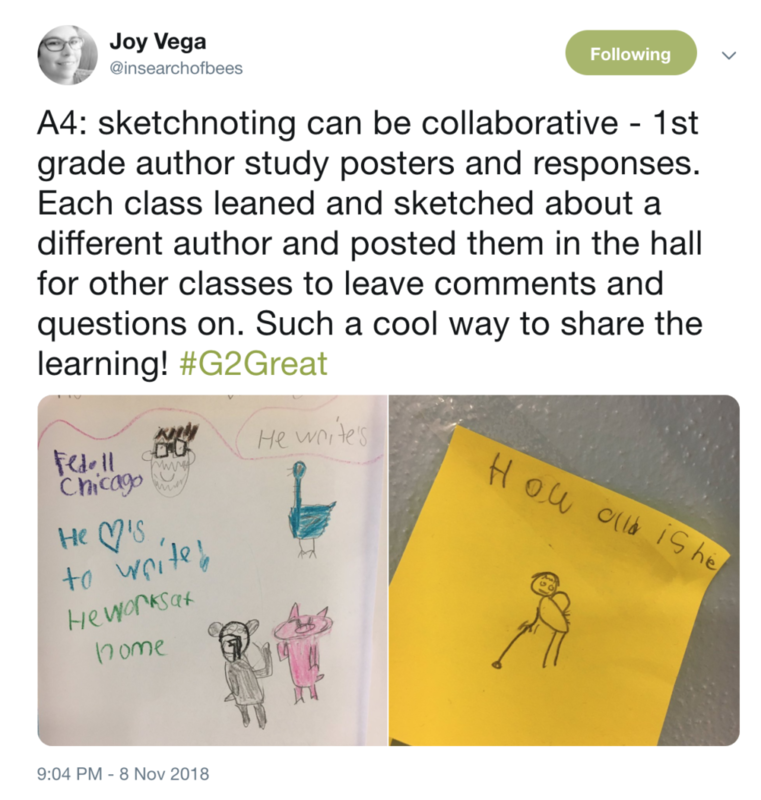 Both episodes are about sketchnoting! 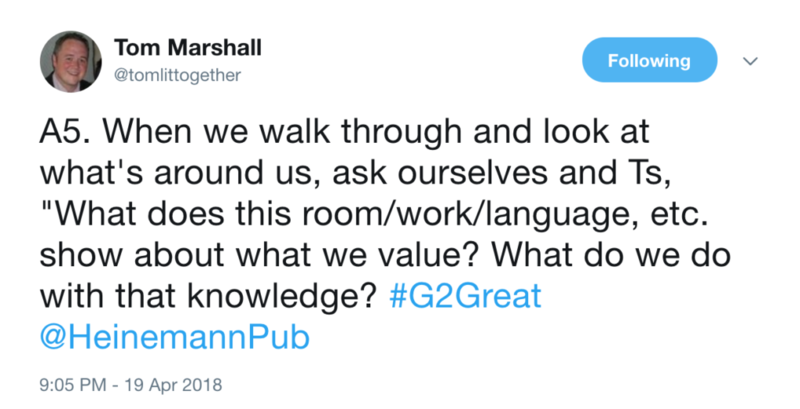 by Jenn Hayhurst On April 19, 2018, #G2Great’s PLN welcomed Tom Marshall to the fold. 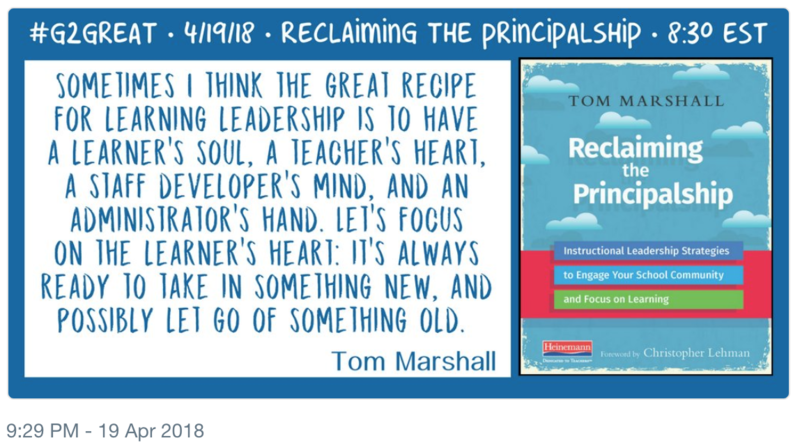 We had an inspired conversation about his new book, Reclaiming the Principalship Instructional Leadership Strategies to Engage Your School Community and Focus on Learning In Tom’s book he extends a beautiful invitation to “Make the word principal an adjective again. Join me, Head Learner, on the journey of reclaiming the principalship in the name of learning!” This is a powerful challenge. He is asking us to consider a richer more meaningful definition of what it means to teach and lead. 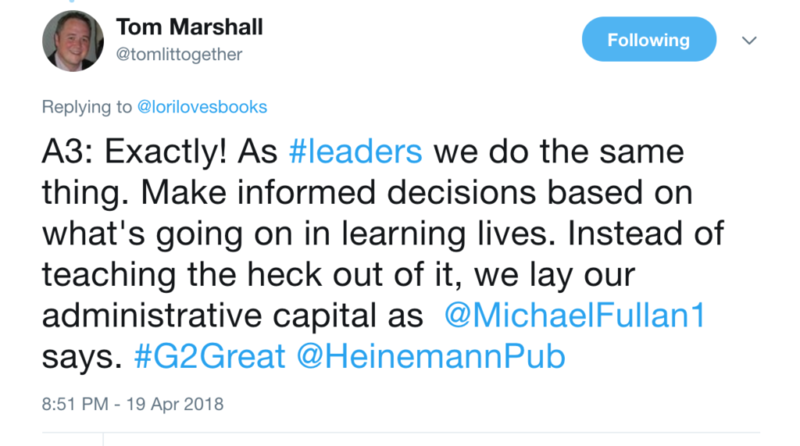 How would school be different if we were learners first? What if we were learners who fostered collaboration and coaching? What if we were learners who were responsive leaders within a learning culture? What if we were learners who honored each other’s values while growing professional discourse? Classrooms are dripping with formative data and it tells a story. It reveals what we value and where we may need to go next. 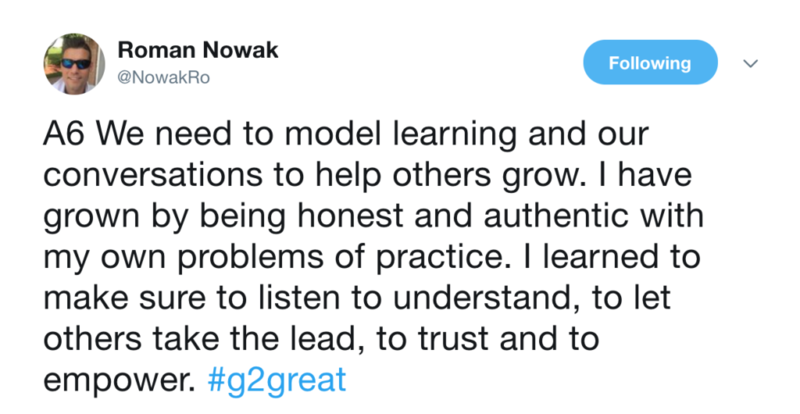 Every time we push ourselves to be honest and authentic about instructional practice we invite growth. This is the first step, the beginning of more substantial conversations that build upon strengths and reflection. What if we were learners who built on community and momentum if we nurtured inner curiosity? What begins with a “What if…” can lead to powerful changes and important discoveries. Tom’s wonderful book was written to encourage us all to adopt a learning leadership stance. Thank you Tom. Your wisdom and passion are exactly the right next step forward in education. 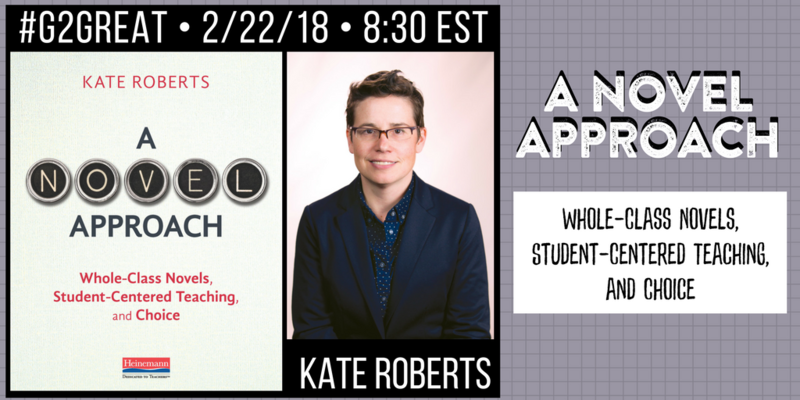 On February 22, 2018, Kate Roberts joined #G2Great to have a conversation about taking a fresh look at the whole-class novel. There is something deeply reassuring about her book, because she asks us to lift our presuppositions, regardless of what stance you take, and find some common ground. What is good about this practice? What’s a potential drawback? How can we elevate this practice so it can evolve based on what we now know about strong instructional practice? 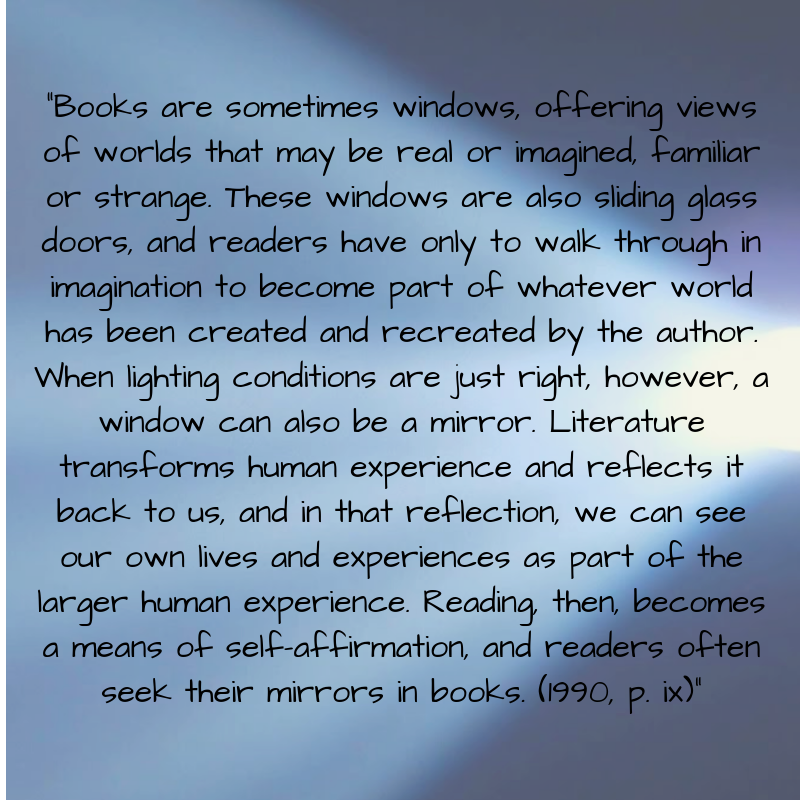 We are all teachers who want to get to the heart of the matter… how do we help usher in the next generation of readers? As with any complex endeavor, there is so much to consider. 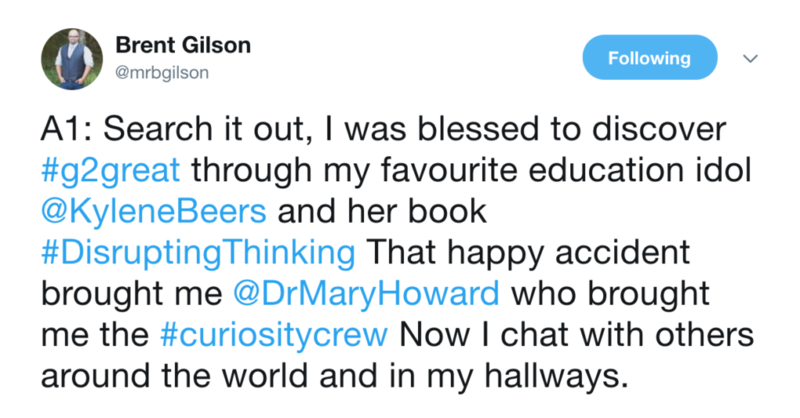 Kate’s book inspired all of us to think past our preconceptions because the more we share the more we could learn from and support each other through professional sharing. Experiences shape us. They fill us up and give us the ink so we may write our stories. If I understand your experience with this instructional move, I can broaden my own understanding. 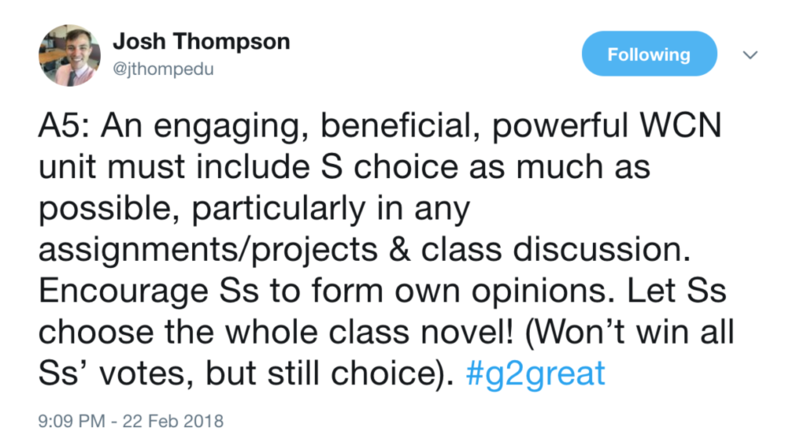 During the chat, I broadened my understanding and I saw the Whole-Class Novel (WCN) as something that is not a yes/ no proposition I re-envisioned it as an opportunity that may be full of potential. We are smarter together! 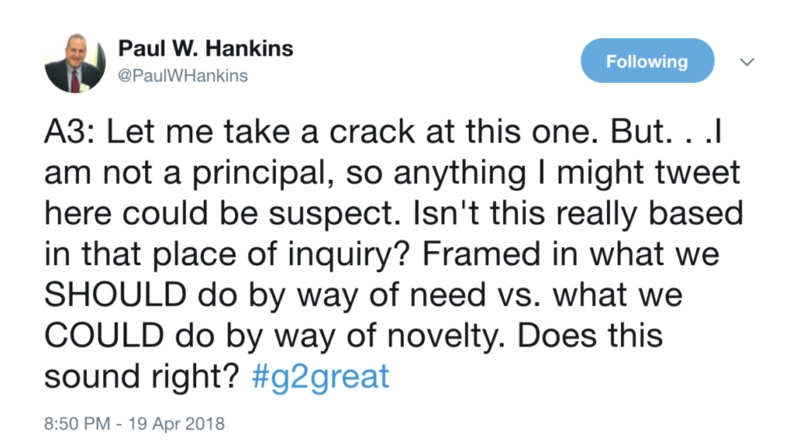 Yes, the Whole-Class Novel can be an object of inquiry. When teachers think about their end goals for using this instructional practice it can grant permission for critical thinking. 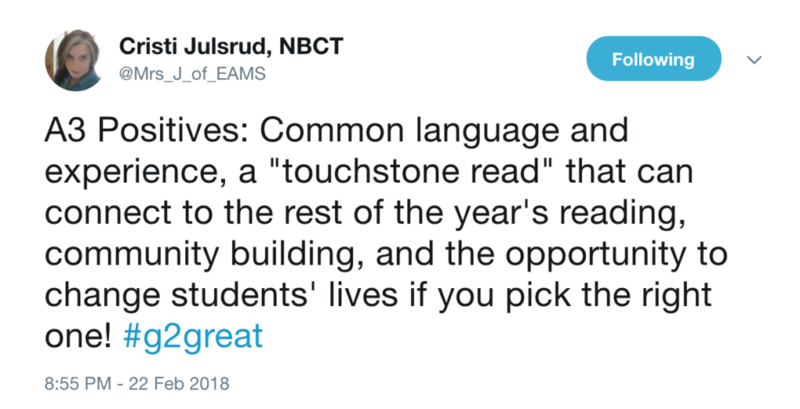 We can take this one book, and open it up to all our students and see where they take it. That can be an exciting proposition. 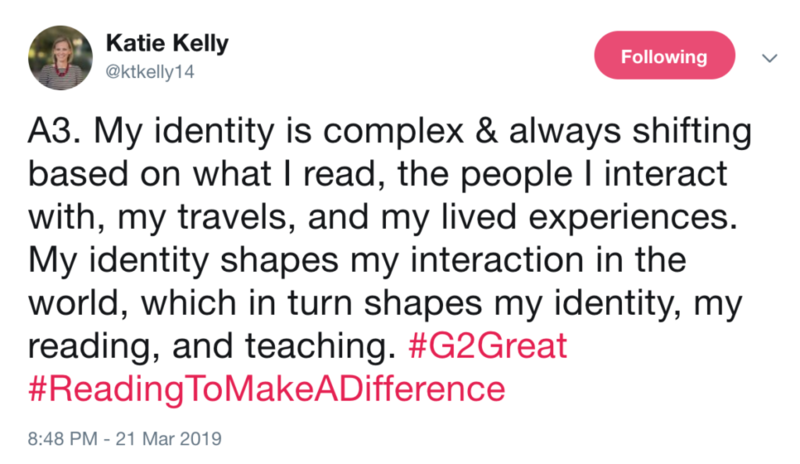 When teachers and students share the journey to make meaning it is magical. 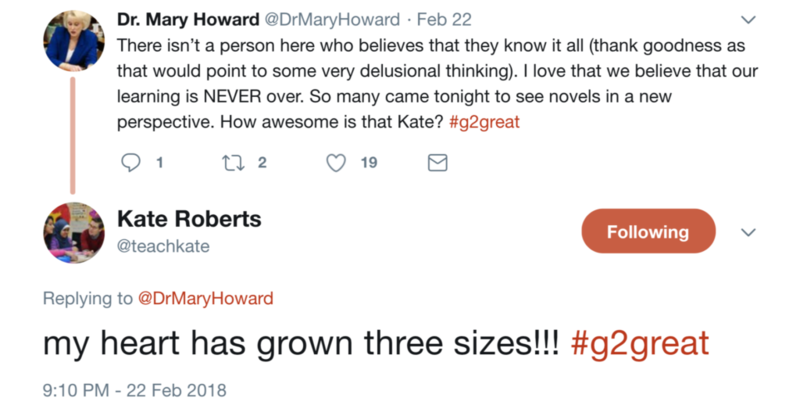 It is also powerful that Kate’s book inspired this revelation for the #G2Great community. This is not an easy proposition but it is a worthwhile one. 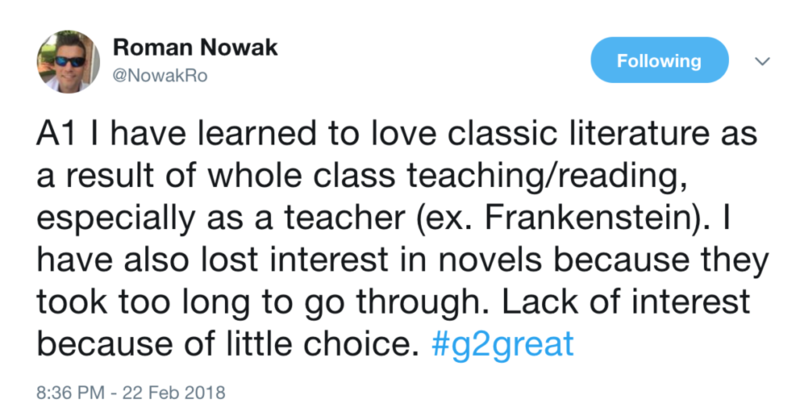 Students will have vastly different interpretations of a book and that’s ok. The classroom is the perfect place to learn how to have those conversations that may not have been possible without this instructional move. 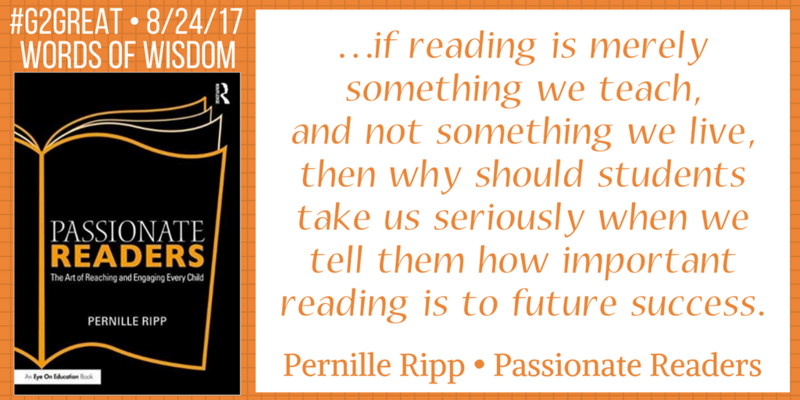 On August 24, 2017, our #G2Great community welcomed back Pernille Ripp with open arms. 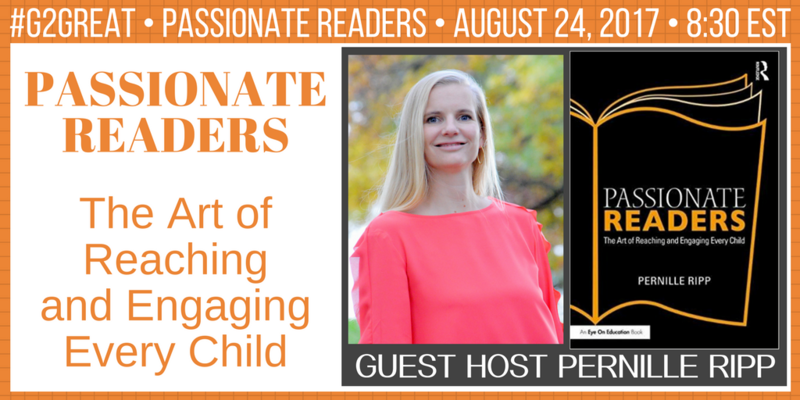 We celebrated her book, Passionate Readers: The Art of Reaching and Engaging Every Child with a thoughtful and heartfelt conversation about what it takes to be a teacher of reading. Pernille is a teacher, she is one of us. She is open and honest about her own personal struggles and shares her celebrations and successes. She lets us into her classroom, and in doing so, we see our own teaching lives revealed. As I read through my Twitter feed, I imagined that I was part of an extended faculty. A member of a dynamic group of educators who cares deeply about our profession. Teachers who understand that together we are changing lives. We are united by a shared purpose and our conversations with Pernille are a prelude to all the good work that lies ahead of a new school year. 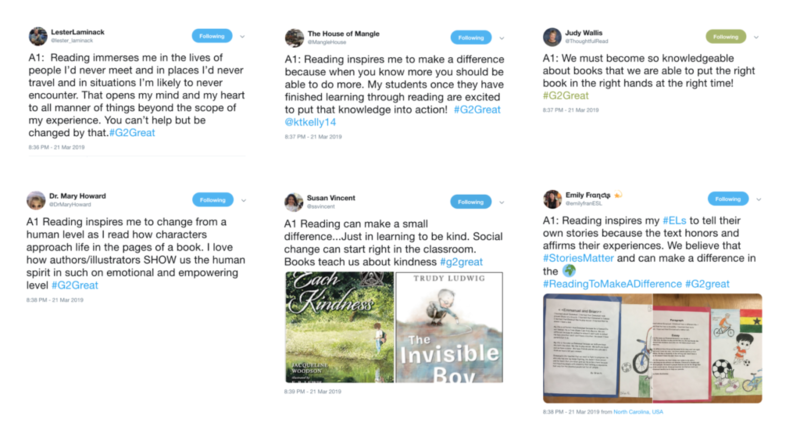 As you read this post, imagine we are in the faculty room, and we are having a good conversation, thinking about the complexities of the work that goes into helping students discover their passion for reading. What is the most important thing to focus on? What should I do to set up a successful year? 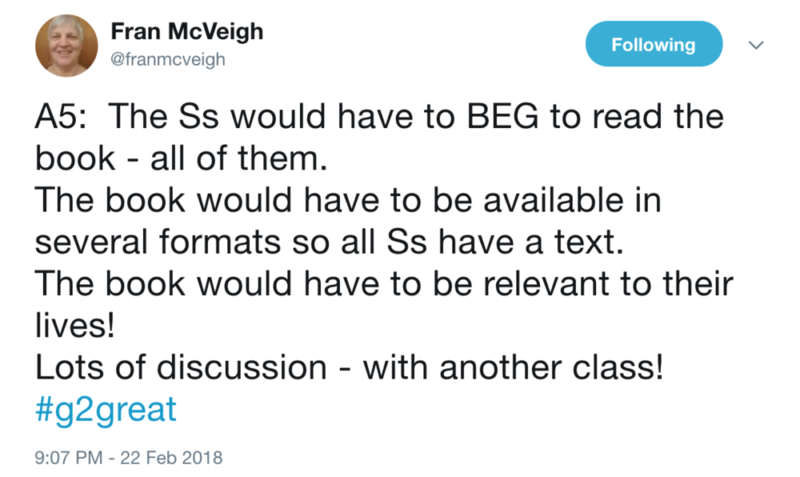 What do I do if students don’t even like to read? Thank you Pernille, you inspired so many of us to dig deep and share what we know. This chat was a glimpse into your marvelous book, which is a beautiful read that is both poignant and practical. Together we can wrestle with the big important questions, and find solutions through our collective wisdom. Fortunately, there are so many talented teachers to learn with as we begin this exciting new year of learning for students as well as ourselves. 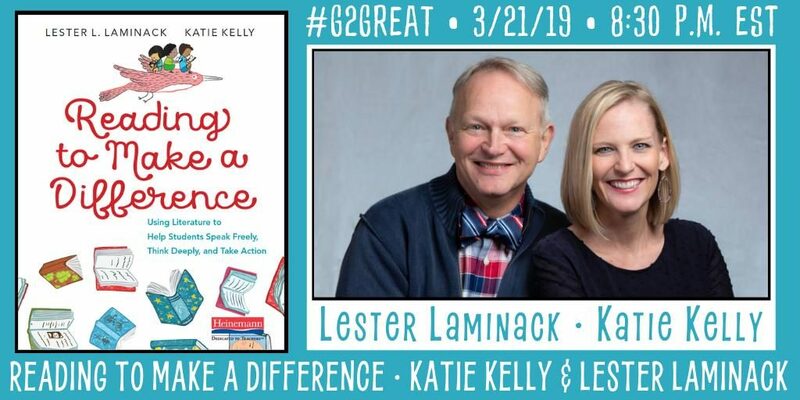 On August 3, 2017, authors Katie Stover-Kelly and Lindsay Yearta joined #G2Great to extend a conversation that began with their book, From Pencils to Podcasts Digital Tools for Transforming K-6 Literacy Practices. 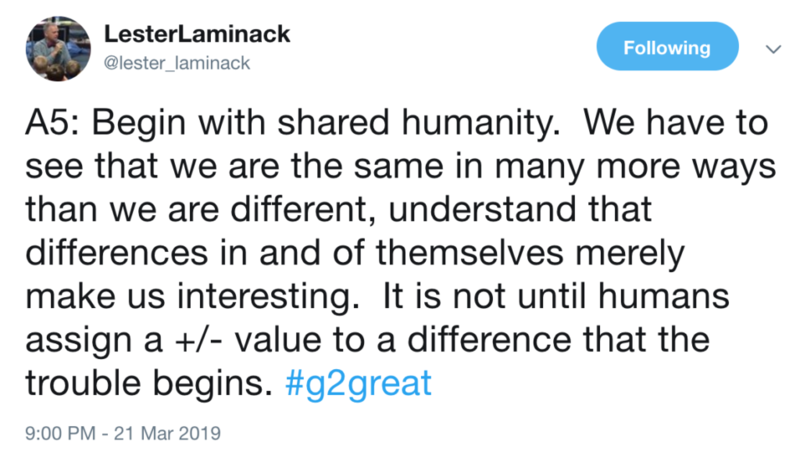 Providing an education in the 21st Century means that whatever our role: teachers, administrators, professional developers, or college professors we need to be open to seeking out ways to intentionally integrate technology with learning. 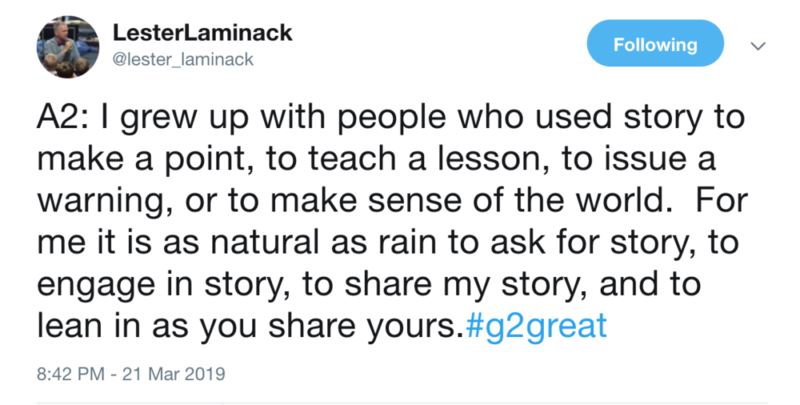 This post is dedicated to the vibrant #G2Great Professional Learning Network, (PLN) because we are a community of educators who are unafraid to try new things, to learn, to mix it up and push ourselves forward in the name of our students. In that spirit, this post is beginning where our chat ended with our future technology goals. To boldly step out of our comfort zones and meet learning at the cutting edge of the 21st Century. 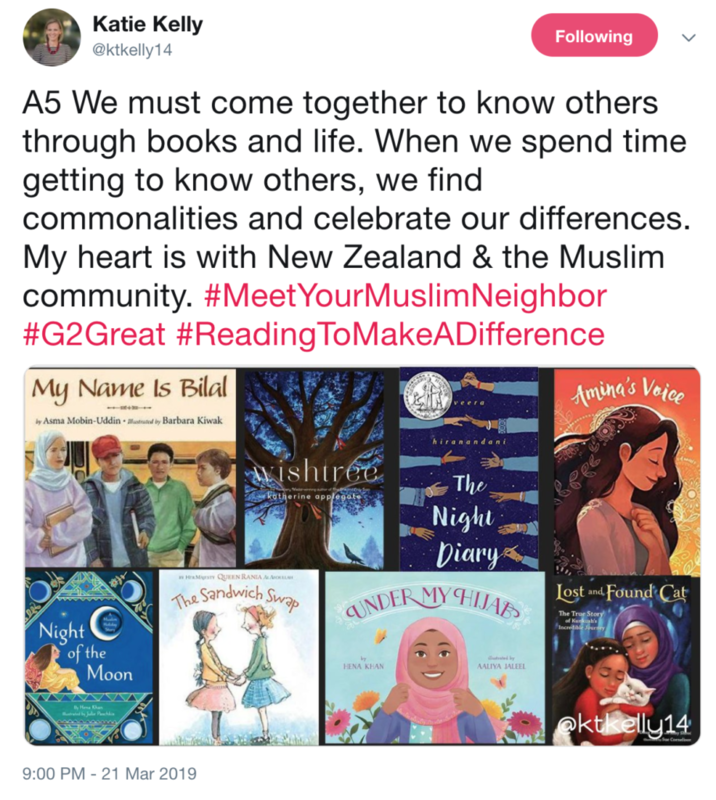 Global Read Aloud is an opportunity to connect and learn around story with a digital backdrop. 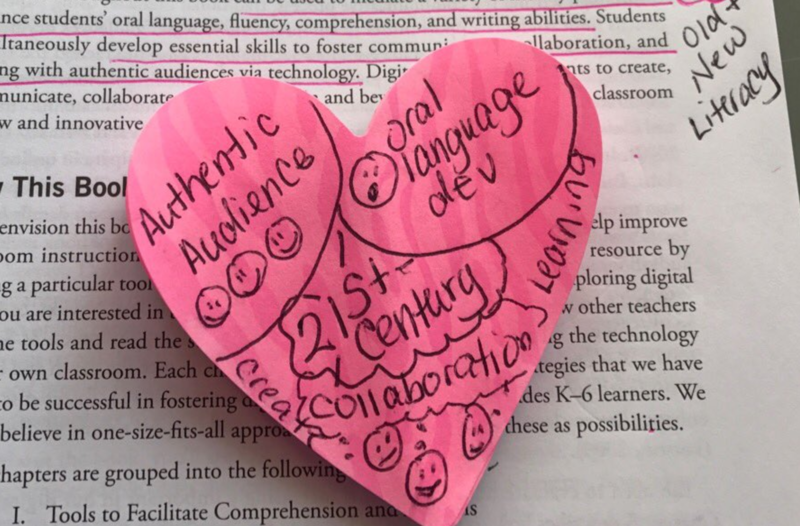 According to Katie and Lindsay, “In this age of digital tools and multiliteracies, there are increasing demands of students to collaborate in order to consume and produce multimodal texts in online spaces. 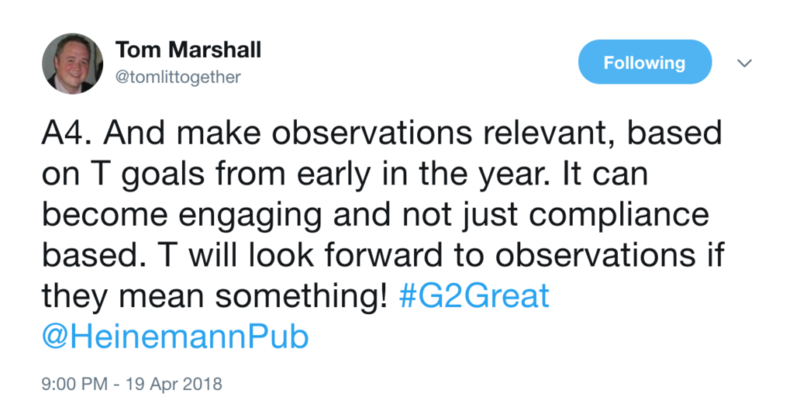 Twitter provides a unique social learning environment, It gives a space for intellectual engagement through live interactions with others. 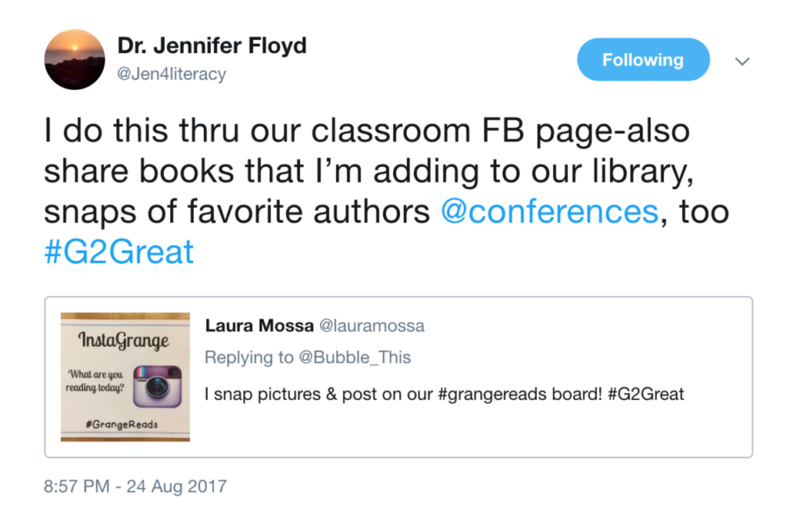 Katie and Lindsay underscore the importance of Twitter in their book, “Twitter provides students with a digital space to connect with other readers and authors to share and discuss books.” However, due to its organization and fast pace, Twitter can be daunting. There is a solution. Tweetdeck is a web-based tool that helps users to organize their Tweets into more manageable columns. It offers many useful features such as enabling users to “pre-tweet” or schedule tweets ahead of time. This is especially useful when planning and facilitating Twitter chats.To learn more, watch this video. Understanding why a goal is important is essential, answering what you will do to accomplish the goal ties it to an action. 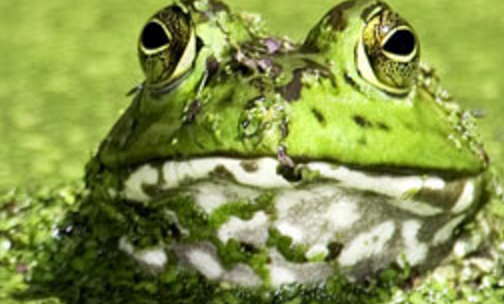 This article offers 15 dynamic ways to make reflection a habit of mind in the classroom. 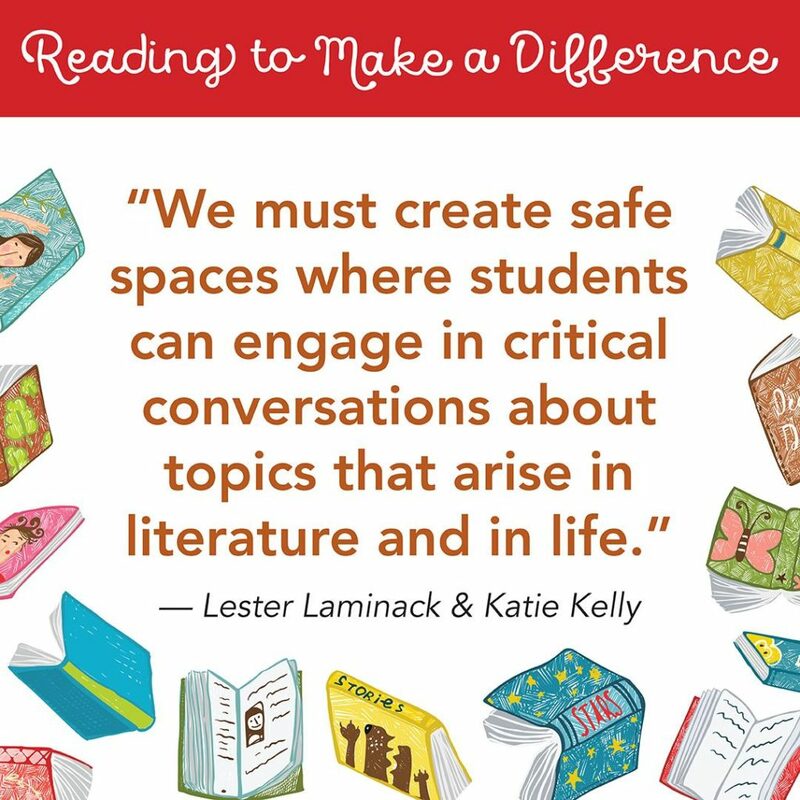 In their book, Katie and Lindsay remind us that, “In the 21st Century, information is updated and readily available in real time.” Collaboration, and reflection begin with us. 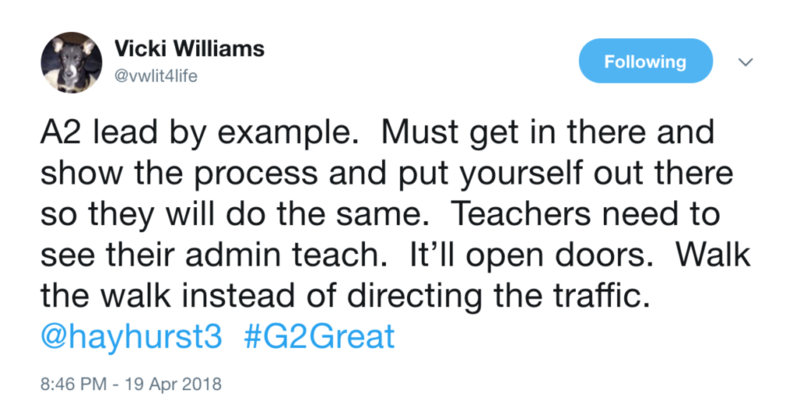 Teachers who lead by example, are the ones who will give students experiences that will help them grow to meet their potential. Thank you for writing this book Katie and Lindsay. It is an incredible resource that teachers need to have in their hands so they can put your ideas to work in their classrooms. I especially love that at the close of your book you extend an invitation to keep the conversation going through Twitter. 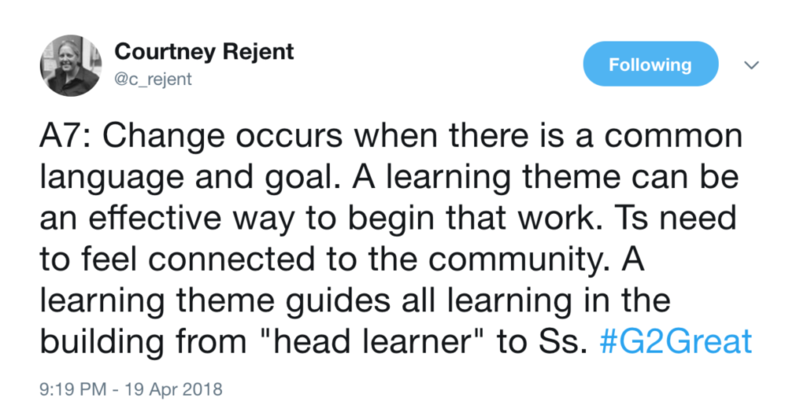 That’s just what you did, and now we have even more resources and ideas to explore. That is is what learning is all about, and we are educators who fully embrace a learning lifestyle. We are flexible thinkers who are fueled by a collaborative spirit ready to take the next step forward together.